The Sauder Village 32nd Annual Woodcarver’s Show and Sale and the Explore the Crafts event will be held Oct. 27-28 in Founder’s Hall. The last weekend of Sauder Village’s 2018 season, Oct. 27-28, will feature the Explore the Crafts event, as well as the 32nd Annual Woodcarver’s Show and Sale in Founder’s Hall. Woodcarvers from throughout the Midwest will gather to represent artists and suppliers from the tri-state region. Guests will have a chance to see the artists and purchase their works and learn more about this traditional art form through various demonstrations planned throughout the weekend. Some of the exhibitor specialties for show and sale include handcrafted wildlife, fish, birds, caricatures, bowls, plaques, ornaments, and pens. There will also be items from artists specializing in scroll saw work, relief carving, woodturning, and chip carving. Throughout the weekend, guests will enjoy watching woodcarving demonstrations and special performances by Wes Linenkugal and his band. On Saturday only, guests can also enjoy a variety of hands-on activities and special demonstrations as part of the Explore the Crafts event. Craftsmen will share their talents while allowing guests to explore their own creativity. Visitors may want to try pottery, making reed baskets, decorating pumpkins, printing, weaving, and making beaded bracelets. They can also try a string art craft, watch drop spindle demonstrations, and help with a harvest wreath activity. Other hands-on activities planned include decorating a birdhouse, making tussie mussies and pom pom monsters, building with wooden planks, and making friendship bracelets. 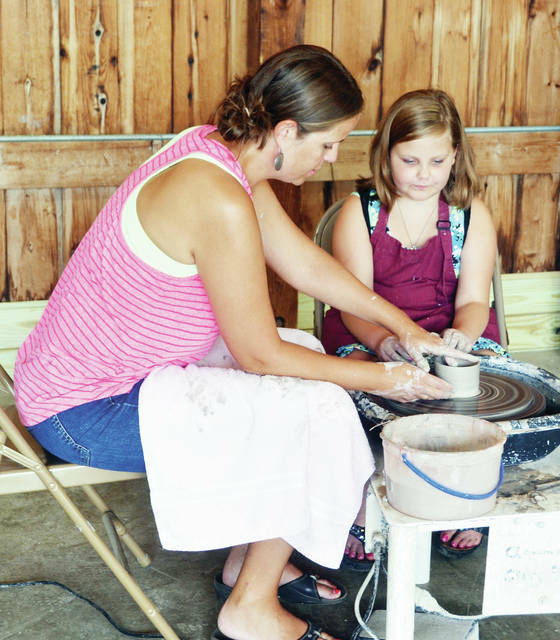 “This popular day offers guests a greater appreciation of the talented craftsmen that work each day at Sauder Village,” Krieger said. The Woodcarver’s Show runs from 10 a.m.- 5 p.m. Saturday, and from 11 a.m.-4 p.m. Sunday. There is a “Show-Only” admission of $8 (enter through Founder’s Hall). For more information, call 800-590-9755 or visit www.saudervillage.org. Sauder Village will close for the regular season on Sunday, Oct. 28, but will offer Holiday Lantern Tours on Nov. 24 and Dec. 1, 7, and 8. Reservations necessary. https://www.fcnews.org/wp-content/uploads/sites/45/2018/10/web1_sauder-village-explore-crafts.jpgThe Sauder Village 32nd Annual Woodcarver’s Show and Sale and the Explore the Crafts event will be held Oct. 27-28 in Founder’s Hall.